Hi there, and welcome back to the Arne Chiropractic blog. 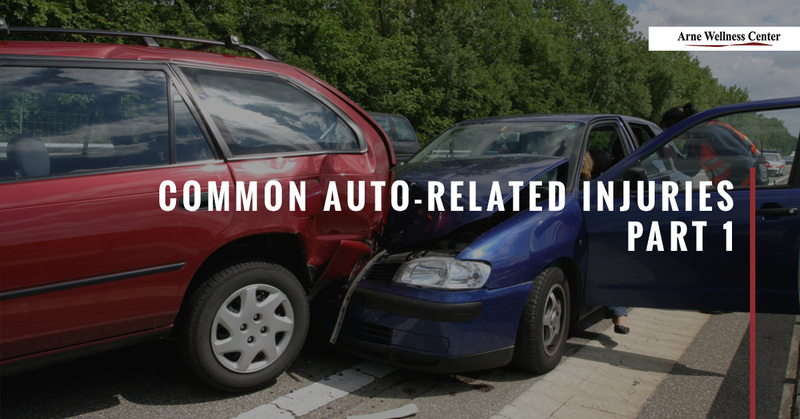 Many people will experience some type of auto-related accident, whether minor or serious. According to the Colorado State Patrol, there have been just over 14,000 reported car crashes in the state in 2017 alone. With the increase in drivers on the road as a result of Colorado’s growing population, the increase in new construction in many communities, and as a result of careless driving and inclement weather, this number is sure to rise rather than remain stagnant. Unfortunately for many, this means that the likelihood of being involved in an auto accident will also increase. No matter how safe people are, there are always unforeseen circumstances that can lead to car accidents. Therefore, in today’s blog, we would like to begin a short blogs series that examines some of the common injuries people sustain in auto accidents, and how chiropractic can help treat these injuries. The most common injuries sustained in car accidents often affect the soft tissue (tendons, ligaments, fascia, and muscle) in the neck and shoulders. The force of an auto injury jars the body which causes the neck to move back-and-forth in a sudden whipping motion. Whiplash often occurs during a rear-end accident, but it is also caused by frontal or side impacts, as well. As a result, symptoms include neck pain, neck stiffness which limits range of motion, neck instability that can make it difficult to hold up the head without additional support, headaches, and shoulder and/or upper back pain. Other symptoms include possible numbness or tingling which radiates down into the arm and shoulder. As mentioned above, whiplash in the neck also affects the upper back and shoulders. Additionally, there are many soft tissues, bones, and vertebrae in the back that tend to suffer injury, too. Auto accidents often trigger upper, middle, and lower back muscle sprains, and can even impact the hips, pelvis, and intercostal muscles of the ribs, causing severe misalignment of the spine. More significant injuries from the force of the accident may impact the spinal column, which can cause painful disc injuries that trigger excruciating nerve pain. Consulting a car accident chiropractor is the best way to begin treating a neck or back injury because he or she can discuss the symptoms, examine the injury, and take or request X-rays or MRIs, if needed. Your chiropractor can then treat the injury by loosening stiff muscles, manually manipulating the spine, decompressing the spine, and may incorporate other treatments and modalities that involve ice, heat, electric stimulation, ultrasound to reduce inflammation, acupuncture, and more, in order to ease pain and discomfort, restore movement, and realign the spine. What’s more, your chiropractor can refer you for massage therapy, physical therapy, or other treatments that work in conjunction with chiropractic care to treat and heal auto-related injuries. Suffering an auto-related injury can be a painful and scary experience, but you don’t have to go it alone. If you have been involved in an auto accident and would like to meet with our team, contact Arne Wellness Center and let us help you heal from your auto injury. Thank you for reading part one of our blog series; be sure to tune in for part two to learn more about the common injuries sustained in car accidents, and how chiropractic care can get you on the road to health.